Since Best Buy is one of the last remaining category killer big-box retail chains, and one of the largest retail companies in the world, the Best Buy corporation falls under scrutiny from a particularly powerful retail microscope. The overarching question is whether one of the last remaining niche big-box retail chains can survive, and if so, what is the Best Buy corporate mission statement, vision, and values, that could make that survival possible?. The Best Buy corporation has not stood behind an official company mission statement for years, at least not publicly. Seemingly this lack of a strong, clear, inspiring mission could be one of many reasons why the Best Buy consumer electronics retailing big-box retail chain has been focused on surviving rather than thriving in recent history. The Best Buy corporation does have several official and publicly available documents which detail its Guiding Principles and Company Policies, however. The company has an official Best Buy Environmental Statement, a Best Buy Ethics Code, a Best Buy Political Engagement and Government Affairs Policy, a Best Buy Supplier Code of Conduct, and a Best Buy Diversity and Inclusion Policy. As if that doesn't define Best Buy specifically enough, there is also a Best Buy Carbon and Energy Statement, a Best Buy Paper Procurement Statement, a Best Buy Standard for Recyclers, a Best Buy Conflict Minerals Statement, and a Best Buy Human Rights Statement. So while Best Buy leaders seem to be crystal clear about how the company interacts with global suppliers and the U.S. government, it doesn't seem to have the same kind of clarity about how to guide its employees to make decisions that will help the company fulfill a specific retail mission. Does the Best Buy Stores Company have a Mission Statement? And, if so, what is it? What Is the long-term, overarching, philosophical vision for the Best Buy electronics retail stores? What are the values of the Best Buy corporation leaders and employee team? Which principles create and guide the Best Buy employee culture? In recent years, Best Buy has worked to define some guiding principles for its employees and a brand promise for its customers. Perhaps these things have existed all of this time, but if so, Best Buy has kept them top secret. Since Best Buy is the only national big box brick-and-mortar U.S. retail chain still focused exclusively on consumer electronics, there's no other consumer electronics chain with which to compare its corporate values and customer promise. The largest competing retailers of electronics products have now become department stores, Internet retailers, and office supply retailers. 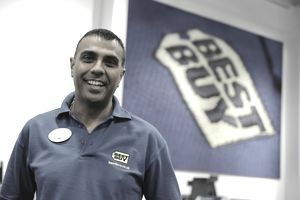 In order to survive as a niche big-box category killer, retain its retail relevance, and compete with Internet retailers, Best Buy is embracing the store-within-a-store concept wholeheartedly. Inside the Best Buy retail stores, retailers like Samsung and Apple operate their own departments.